The posters that go up around towns and villages announcing the death of a loved one are a very public way of expressing grief, and of course inviting the whole world to the funeral. As in life, so in death! The standard cemetery in most Italian towns and villages is a walled enclosure on the outskirts. Often owned by the local comune rather than the church, most consist mainly of ossari, multi-storey rows of concrete vaults, a practice echoing those of the ancient Etruscans and early Christians, sealed with a marble plaque bearing a stiffly formal photo of the inhabitant in life. Rickety portable stairways allow relatives to visit the higher levels to pay their respects. By night these walls flicker with the light of perpetual candles under the ubiquitous cypress trees. For the wealthy it’s a different story, as the Staglieno cemetery on the outskirts of Genoa - one of Hemingway’s wonders of the world - testifies. 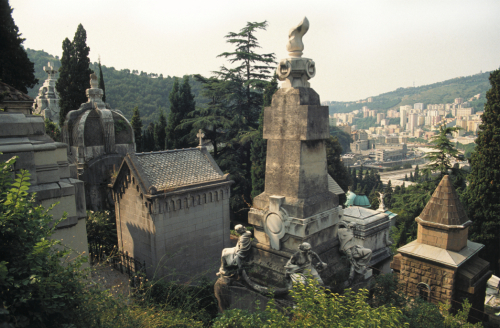 Here the rich of the late 19th and early 20th centuries wait out the afterlife in fine style, with an astonishingly ornate collection of marble mausoleums, chapels and huge bronze statues set in the lush green hillside. In the shadow of towering cypresses and monumental cedars, sculptures (for there can really be no other name) span the great art movements of the period, from neo- classical to art deco and art nouveau. If they couldn’t take it with them, the wealthy genovesi certainly left a conspicuous reminder for all to gaze upon. Perhaps the line between gilt and guilt is but a fine one! Few locals make the trip out to Staglieno during the week, and you’ll often have the place to yourself. 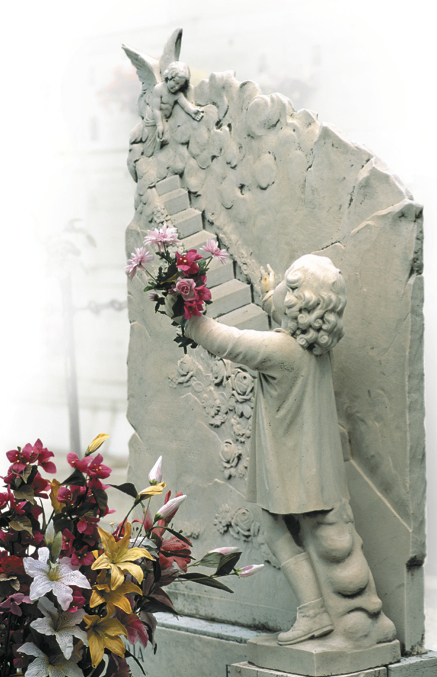 It’s an eerie and haunting experience, surrounded by hundreds of life- size carved death beds, attended by grieving families forever frozen in their marble despair, or representations of the deceased wrestling with death in the form of winged angels. 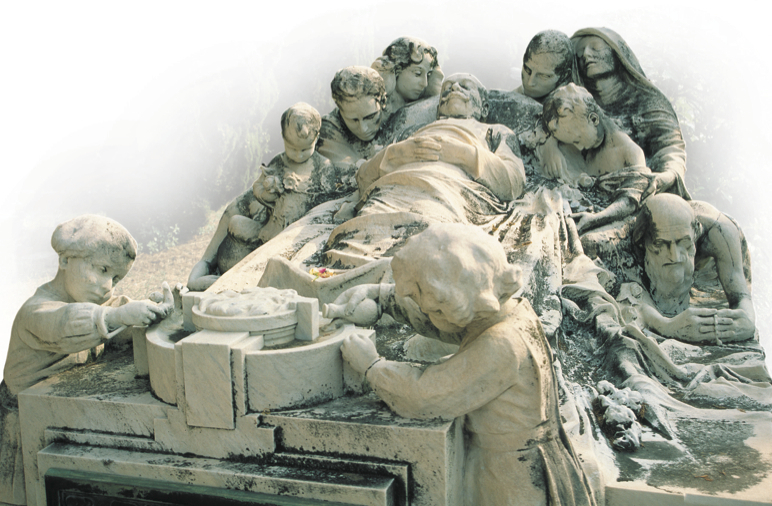 Most poignant, apart from the tear-jerking areas devoted to children, is the final resting place of Caterina Campodonico, a simple street vendor of nuts, who saved all her life so that she might have a funeral monument to rival that of Giuseppe Mazzini, the hero of Italian unification. Oscar Wilde’s wife lies here too, a long way from her husband, who rests in his magnificent art deco mausoleum in Paris’ famous Père Lachaise cemetery. The trulli town of Alberobello in Puglia echoes another fascination of early 20th century death. 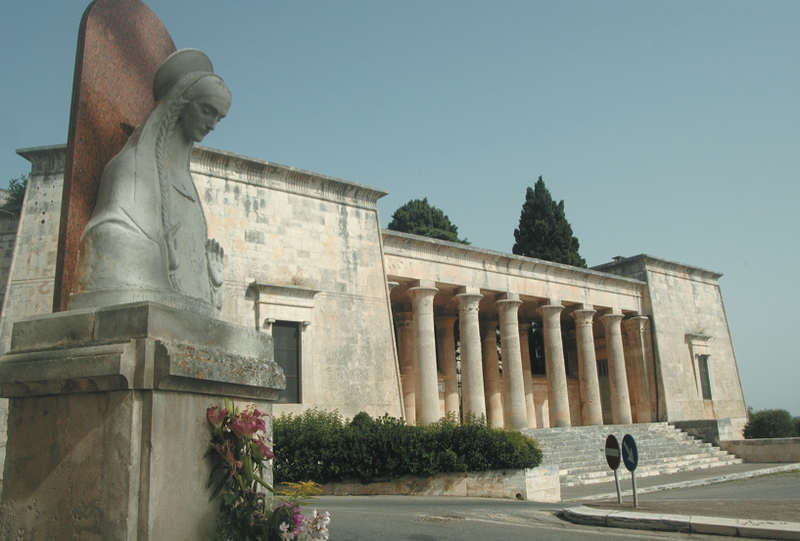 Towering above a crossroads on the edge of town, its grand cemetery resembles more a mortuary temple from the Upper Kingdom, having been rebuilt in the Egyptian style gaining popularity across Italy after archaeologist Guiseppe Belzoni’s discoveries in that country. The entrance building is nothing less than a hypostyle hall of high columns, their capitals carved with traditional closed palms, while the monumental area beyond is busy with pyramids – traditional and stepped – and other mausoleums reminiscent of the Nile culture. Caius Cestius would have approved. This Roman noble was so taken with the Egyptian way of death that he commissioned his own massive pyramid in Rome, where he has slept for the past two millennia. Perversely, Caius lies alongside the Cimitero Acattolico, or Protestant Cemetery, next to Percy Bysshe Shelley, whose remains were buried here after a failed cremation on the beach at Lerici, south of Genoa. Remarkably few Italians choose to follow the ways of their early Etruscan forebears and be cremated, still preferring the slow decay of ages approved by the Catholic Church. Also in Rome is perhaps the most macabre cemetery, where a series of crypts under the Capuchin Chapel contain the bones of over 4000 monks. The lucky ones lie, sit or stand intact in niches and alcoves, the less fortunate have their bones arranged in elaborate patterns across walls and ceilings everywhere! Cemeteries of necessity had to be placed out of town to prevent disease. 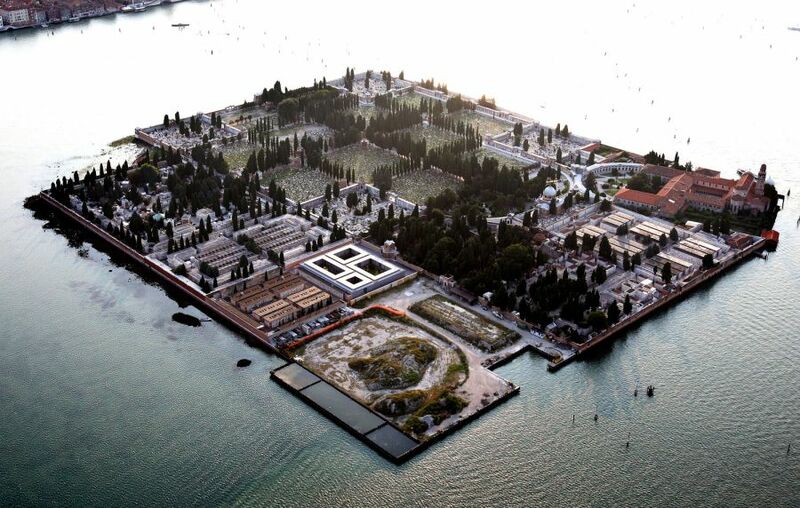 Accordingly, in waterbound Venice, burials on the ‘mainland’ were banned by Napoleon in the early 19th century. Instead all bodies were rowed to the island of San Michele for interment. Today, it is all but full and sees few burials. Its lonely inhabitants are disturbed only by the arrival on a funereal black gondola of the select few who still have a family mausoleum here, the regular vaporetto bearing relatives come to maintain a loved one’s plot, and the cultured tourist, seeking the graves of Ezra Pound, Stravinsky and Diaghilev. San Michele also houses the deceased from the Greek and Protestant faiths (Jews are buried on the Lido), and here perhaps you can see Italy’s religious psyche laid bare. While the immigrants lie mostly in unkempt plots, the Catholic areas are well looked after by a regular stream of relatives. In death, as in life, la famiglia is all important.